Uncomplicated obesity is associated with left ventricular hypertrophy, which is an independent risk factor for cardiovascular events. Excess body weight has a linear relationship with vascular mortality. 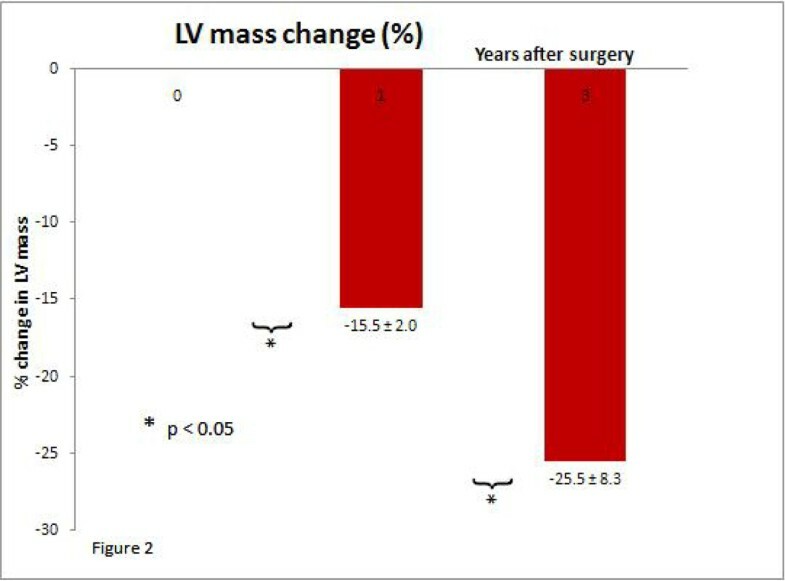 We have previously shown that weight reduction surgery is associated with LV mass reduction 1 year later. Here we have used CMR to investigate the effects of weight reduction surgery at 3 years. 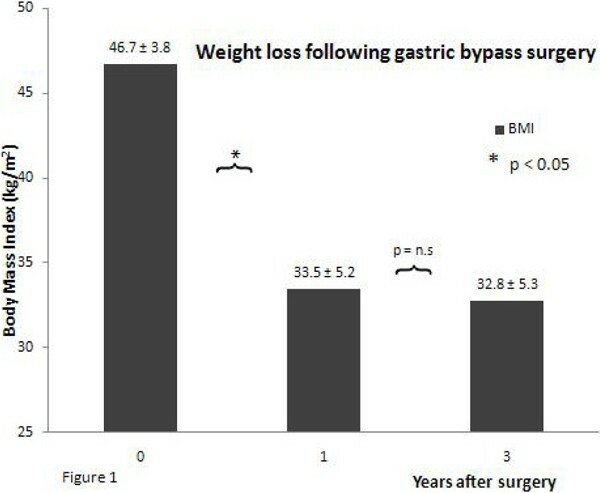 We followed up 6 patients who had undergone Roux-en-Y gastric bypass surgery for obesity (Body Mass Index 46.7 ± 3.8 kg/m2). All subjects had no other identifiable cardiovascular risk factors: diabetes, hypertension, hypercholesterolaemia, smoking, obstructive sleep apnoea or known cardiac disease. The subjects had CMR scans (1.5 Tesla, Siemens, Erlangen, Germany) and body composition analysis performed at baseline, 1 and 3 years. At one year, there was a significant reduction in BMI by 13.2 ± 3.8 kg/m2, representing 28% of pre-operative BMI (Figure 1). LV mass had decreased by 15% from 149 g to 126 g (p < 0.01, Figure 2) during this period. At 3 years, although body mass index did not decrease further significantly, there was a significant additional reduction in LV mass from 126 g to 110 g (p = 0.04), representing a further 11% reduction in LV mass from baseline. Over 3 years, weight reduction surgery is associated with a significant progressive reduction in LV mass, which continues even after BMI has stabilised after 1 year. This represents long-term LV remodelling in response to marked weight loss.